○Unnecessary connections of nerve cells in the human brain is removed rapidly when it comes to 11-year-old. Then, the signal is transmitted earlier by nerve becomes thick (development of myelin sheath), so that the brain becomes possible to perform processing efficiently. ○Myelination of the prefrontal cortex continues actively until about 25 years old. ○Brain can change by training. = It is possible to change your character. 1. Positive thinking = Shake off the negative thoughts. 4. Continue it easy.・・・Because it’s not easy. ☆The brain is the growing connectome! ... The brain is not only the fact that the most advanced structures in the universe, even it grow! A connectome  is a comprehensive map of neural connections in the brain, and may be thought of as its "wiring diagram". More broadly, a connectome would include the mapping of all neural connections within an organism's nervous system. 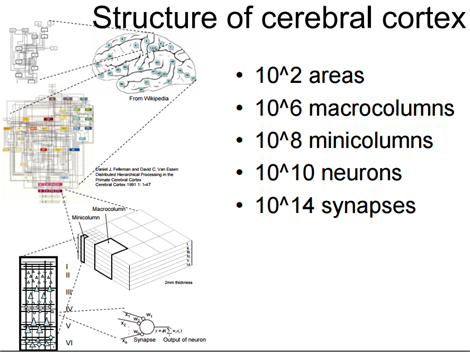 The production and study of connectomes, known as connectomics, may range in scale from a detailed map of the full set of neurons and synapses within part or all of the nervous system of an organism to a macro scale description of the functional and structural connectivity between all cortical areas and subcortical structures. The term "connectome" is used primarily in scientific efforts to capture, map, and understand the organization of neural interactions within the brain. ☆Comparable to the brain is growing artificial intelligence（ＧＡＩ）. ☆ Growing artificial intelligence（ＧＡＩ） is a complex of brain and artificial intelligence. ☆Because the brain is the most advanced structures in the universe. ○Features of the brain is learning and creativity. ・It has based on Bayes' theorem, which was discovered in 1763 by British pastor Thomas Bayes (1702 (?) - 1761). ※Self-organizing map：It is a neural network algorithm of unsupervised proposed by T. Kohonen. ※Independent component analysis：It is a calculation method for separating a signal of multivariate into additive components. A typical application is the sound source separation to extract the voice of a specific person from a plurality of human conversation, which was recorded in a room. ※Reinforcement learning：It is learning to adapt to the environment through trial and error. 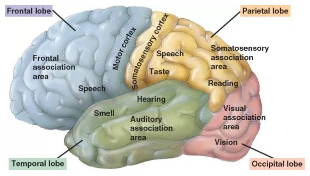 ○A Brodmann area is a region of the cerebral cortex, in the human or other primate brain, defined by its cytoarchitecture, or histological structure and organization of cells. He divided the human cerebral cortex into 52 areas (fields). ○Suppression of emotion, language and motor function change with frontal lobe lesions. 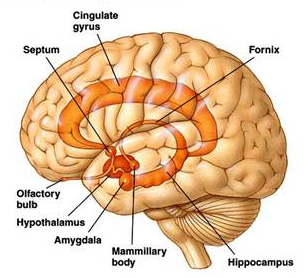 ○ Limbic system is a collective term such as amygdala, hippocampus, mammiliary body. ○ The role of limbic system is memory (short-term memory and long-term memory), emotion, motivation and intuition. ○ Limbic system has a strong relationship with the olfactory function. ○Nucleus accumbens produces GABA, a transmitter of "motivation". 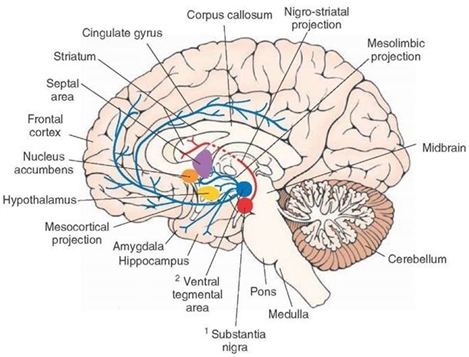 ※The nucleus accumbens is often described as one part of a cortico–basal ganglia–thalamic loop. ○As far as the basic emotional mechanism is concerned, there is no big change in humans and other primates. ・Endorphins are sedative and analgesic hormone that acts on the brain's reward system 6.5 times as much as morphine. Endorphins are the abbreviation of endogenous morphine, named endorphin, because it causes the same action as morphine. ・Endorphins are secreted at important parts of the whole body. ・In addition, endorphins increase T cells, B cells and NK cells (natural killer cells), which are immune cells. ・Dopamine is involved in the remuneration system, and plays an important role in motivation, learning, memory, etc. In extreme terms, humans live for the purpose of secretion of dopamine. ３９−３−３−２　Where are the hormons secreted from? ○Oxytocin and endorphins are secreted from the hypothalamus. 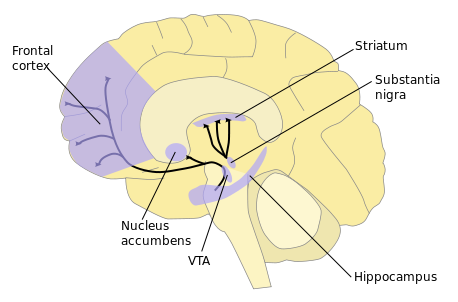 ○Dopamine is secreted from the substantia nigra dense part(A9) and the ventral donning field(A10). • In patients with Parkinson's disease, nigral (A9) dopamine neurons die, resulting in less dopamine released in the striatum causing symptoms such as immobility, stasis and tremor. ・In the case of Parkinson's disease, only dopamine neurons are almost dead and other neurons remain normal. ○Oxytocin excess：The receptor of oxytocin decreases, resulting in increased aggression and anxiety. ○Dopamine excess：Hallucination, delusions, paralysis, obsessive-compulsive disorder, overeating, sometimes aggressive ・・・Same as withdrawal symptoms of stimulants. • Tobacco and stimulants such as narcotics, cocaine, amphetamine increase dopamine and become addictive. 9. Give and Get creative：In satisfying the physical needs, the suppressing substances trying to suppress it are released. However, when realizing the spiritual desire such as "love for humanity" "meditation" "art" "self-enhancement", the three hormones continue to be released without being suppressed. ○Dopamine is secreted from dopamine nervous system (aka A10 nervous system) by endorphin suppressing GABA neurons in ventral tegmental area. ○Since endorphins are present in unicellular organisms, they are considerably older than oxytocin. ○The amount of secretion of endorphin decreases due to stress and fatigue, excitation hormone noradrenaline is secreted instead. ○Stress inhibits the secretion of dopamine. The BRAIN Initiative (Brain Research through Advancing Innovative Neurotechnologies, also referred to as the Brain Activity Map Project) is a proposed collaborative research initiative announced by the Obama administration on April 2, 2013, with the goal of mapping the activity of every neuron in the human brain. Based upon the Human Genome Project, the initiative has been projected to cost more than $300 million per year for ten years. The Human Brain Project is a large 10-year scientific research project, established in 2013, coordinated by Henry Markram (École polytechnique fédérale de Lausanne) and largely funded by theEuropean Union, which aims to provide a collaborative informatics infrastructure and first draft rodent and human whole brain models within its 10 year funding period.The project is based inGeneva, Switzerland and was initiated by Markram. ○Immunity：To escape disease with aware of the pathogens and cancer cells in vivo. Plague (disease) by infection with pathogenic bacteria can be resistant, and we can be difficult to disease. ○	There is two type of immunity, the innate immunity of almost all organisms and the adaptive immunity of vertebrate. ○Innate immunity that leukocytes (phagocytes) eat pathogens are innately equipped. → The innate immune system can not function adequately against new viruses. ○The adaptive immunity：lymphocytes(specific leukocytes) produce acquired antibodies against viral and other pathogens (antigens) to suppress the activity of the virus. ○In lymphocyte balls, the information for production of antibodies (proteins) does "memory" into DNA. This is called immunological memory. ○Dr. Susumu Tonegawa won the Nobel Prize in this immunization research field (elucidation of the hereditary principle of antibody generation) in 1987. ○Immunological memory and cerebral memory work by the same structure, and both of immunological systems (lymphatic system) and nervous systems are everywhere spread in the whole body. 7.Yuuji Ichisugi, Haruo Hosoya, "Computational Model of the Cerebral Cortex that Performs Sparse Coding Using a Bayesian Network and Self-Organizing Maps"